Packing. It can make or break a trip. We’ve all been on both sides of the coin—happy and thanking yourself for remembering that one thing you wound up needing or feeling the regret that comes with realizing there was something you should have brought but didn’t. Recently, one of our Designers, Paula, returned from our Grand Tour of South America with a whole new perspective on what to bring when traveling to this part of the world. Here are five things she wouldn’t go back without. 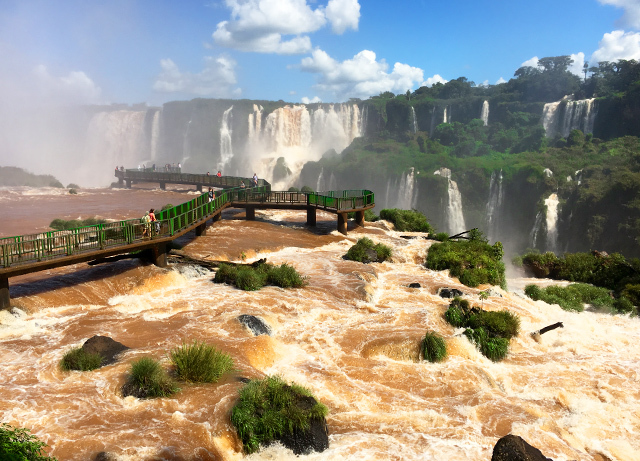 When you visit Iguassu Falls, you will get soaked. The falls are so massive that getting wet is unavoidable—even when you’re standing at a distance. The wind can carry mist from the cascades, so if it seems like you’re far away there’s still a good chance it’ll get to you. Another place a jacket comes in handy is in Peru. Here, especially in the mountains, the weather changes pretty quickly. As we were out exploring, we ran into some unexpected rain showers, so I was glad I had mine on hand. This is another must. Most of this tour involves pretty extensive walking through nature, so you’ll want to be able to keep things like a water bottle, bug spray, camera, and other essentials close and at the ready. A backpack is perfect for carrying all of these things while keeping your hands free. It can also double as an overnight bag, which you’ll need for your visit to Machu Picchu. Picking the right clothes to pack for this trip was particularly challenging for me since it has both urban and outdoorsy moments. To maximize space in your suitcase, it’s important to bring things that can easily transition from city-chic to practical. I wound up bringing a large gauzy scarf that could dress up an outfit but also cover my neck and shoulders to protect myself from the sun. I also invested in a pair of waterproof Tevas which were great to have for hiking, but fashionable enough to wear out in the cities we visited. The sun in South America is no joke, especially in Peru where you’ll be closer to the equator and at altitude. Here, it’s not only possible to get burned on a cloudy day but almost guaranteed if you haven’t remembered to bring your sunscreen. To avoid sunburn, make sure you keep some with you at all times—and don’t forget to reapply! This goes on my list of things I didn’t bring, but wish I had. I think I took over 300 photos on this tour, so my phone was running low on battery more often than not. You’ll see so many amazing things as you go, and you won’t want to miss capturing a moment because your phone or camera battery dies halfway through the day. Being able to keep electronics charged while you’re on-the-go will definitely bring you some peace of mind.